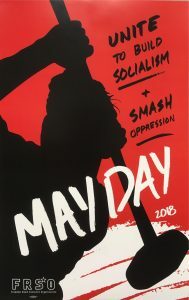 International Workers Day was born in the USA. Forced to work long hours for low wages, workers across this country, many of them immigrants, marched by the hundreds of thousands on May 1, 1886. They demanded an eight-hour workday. This massive showing of worker power shook the ruling capitalist class. The bosses turned out police and anti-union strikebreakers to physically attack workers. Eight strike leaders were framed up and jailed. Four were hung – the Haymarket Martyrs. Like Trump today, the politicians used anti-immigrant rhetoric and red-scare tactics. The executions sparked worldwide outrage, and workers in many countries won the eight-hour workday. Inspired by the Martyrs of Chicago, May 1 became International Workers Day! All is not lost however! Last year more people took part in protests than ever before, and in West Virginia teachers and support-workers just won a strike. They shut down the entire state’s public school system for nine days. The strike won a 5% pay increase and a temporary halt on politicians plans to cut health insurance. The teachers proved that by stopping work and building solidarity, it is workers – not laws drawn up by the 1% – that have real power. Teachers in other states are already learning the lesson. As Trump exposes the naked greed and brutality of the U.S. system of capitalism for the world to see, working people – especially young people – are looking to alternatives. They are beginning to favor socialism over capitalism, and are increasingly willing to fight for it. Under capitalism, the ruling class of billionaires, with their banks and corporations, hold political and economic power. Trump is their brainchild. New Orleans – People are Dying Demand Relief, Action and Justice Now! Next post Solidarity with Colombia! Freedom for Jesus Santrich! Implement the Peace Agreement!